A group of us were at Zawa’s the other night, after the Heritage Awards, relaxing over food and beers, when the conversation turned to the short one-storey flat-roofed building that sat at Commercial & Venables until it burned down at the end of the 1990s. It seemed that most of us had memories of one store or another that had done business in those four storefronts: Everbest Grocery, Master Tailor, Grape Escape, the conctionery store that had twelve owners in its first twenty years, and many more, including cafes, furniture stores and political hang-outs..
That got me remembering the problem of dates. There was an assumption that the building had been erected in 1907. However, I was never sure of that date. There had been no entries for any buildings at that end of the block until 1923, when they all suddenly appear at once. A more logical suggestion is that the building was erected in 1922 ready for full occupation by the following year. It has the appearance of similar buildings erected by Angus Campbell up and down the Drive in the late 1920s and 1930s, but I am not sure exactly who built this one. The image above is dated 1922 by City Archives. And the evidence is plain, there were no buildings in that entire quadrant of Block 22 in December 1911. Thus, the 1907 building date previously accepted by most of us appears to be inaccurate. I am not aware of any later photographs that could prove the case, but I strongly suspect that those first four lots on Commercial remained vacant until 1922. Another brick in the wall of Grandview history. Many thanks to Patrick at Heritage Vancouver for wading through his pile of water permits! Just the other day I was standing on Commercial Drive looking across at two of my favourite buildings which are in the centre of the east side of the 1600-block. The building on the left is the Odlin Block and the building on the right is the Rodway Block. My interest was piqued because these buildings were erected at essentially the same time, on the same size lots, and were designed to service the same marketplace — retail stores with apartments above — and yet their designs are so different. That intrigued me enough to look deeper into their histories, wondering whether these designs reflected their original developers. Harry N. Odlin was a barber downtown. He first appears in 1896, working for John Lambert at 530 Georgia Street, and by 1900 he was at the Elite Barber Shop at 617 West Hastings. Between 1902 and 1914 he worked in partnership with another barber, Charles Herman, at various addresses on West Hastings and Granville Streets, and he lived at 1123 Nelson Street. 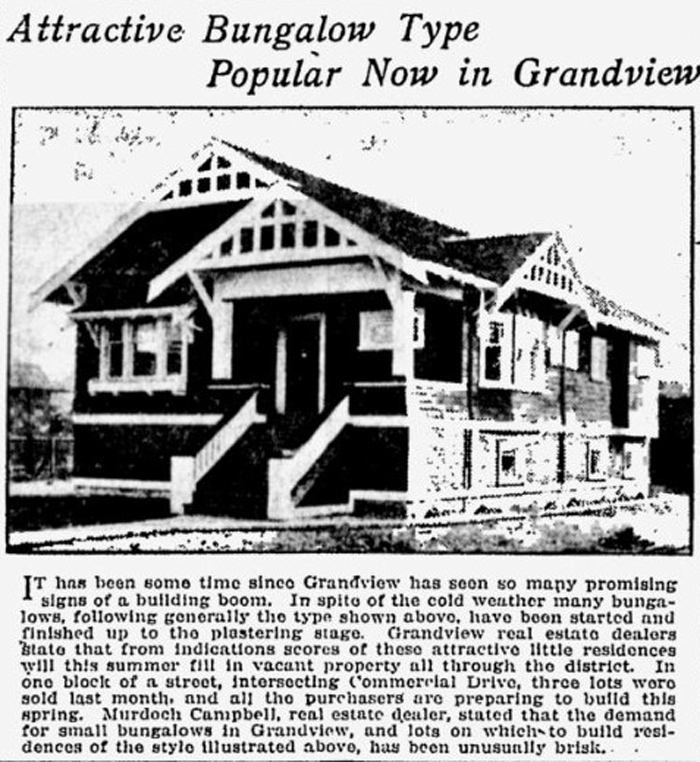 He appears to have been wildly successful (perhaps not just from barbering) because by 1911 he had purchased an expensive waterfront lot where he built a fine two storey $3,700 dwelling at 3197 Point Grey Road that, much enhanced, still exists. Odlin was also able to buy a 33 foot lot in the 1600-block of Commercial Drive (then known as Park Drive) at the height of Grandview’s speculative bubble. Lots of this size were selling for about $10,000 that year, although he may have purchased it earlier. He was issued two building permits for the site in April 1911 to erect a building valued at $7,500 designed and built by W.W. Brehart. When it was completed by the middle of 1912, one storefront was taken up by Philip Timms, a photographer, the other by a confectioner, and the apartments began to be filled. In 1912, Harry Odlin listed himself in the Directory as a realtor. However, he was in fact still a barber, operating as the St. Regis Barber Shop on Dunsmuir Street until the late 1940s. His long and rather uneventful career suggests a steady conservative man, and his building — the Odlin Block at 1608-1612 Commercial — reflects that same conservatism with its flat unadorned brick facade. Next door the situation was very different. Joseph Rodway was a sheet metal manufacturer who had been born in Manitoba in the 1850s. He moved his large family first to Alberta and then to Vancouver where he took up residence at 1644 Woodland Drive. He found the money to buy the lot next to Harry Odlin’s and in July 1911 he was issued a permit to erect a $10,000 building. He hired W.G. Thomas to design it and a Mr. Wood to build it. Unlike the flat brickwork of its neighbour, Rodway ordered up a building with bay windows and significant amounts of ornamentation. It is easy to believe that the pressed tin cornices, wall pieces and window parts were a deliberate advertisement for Joseph Rodway’s own business which eventually took over both storefronts. By the time the business opened at the new store, Rodway was already in his late 50s and the company was operated by his son Albert. The Western Call reported at the time that the business was “prospering” under Albert’s “able management.” However, it seems that sheet metal work wasn’t what the son wanted, and by 1914 the business had been sold to newcomer Fred Hamilton. Joseph Rodway worked for Hamilton for a short while, but then retired and he was dead by 1922. Fred Hamilton operated his hardware and plumbing business at 1618 Commercial until 1945 when he moved up the street to his own building at 1447 Commercial where the company stayed until February 1969. So, is it possible that the conservative barber and the flamboyant sheet metal maker are memorialized in the very different designs of their neighbouring buildings? I believe it is. While I was researching this piece, Don Luxton kindly sent me this wonderful video of a tin shop in Missouri which gives a close look at the business and the pieces of architectural ornamentation that are possible to make. This little piece comes from the Vancouver Sun 2 February 1922.